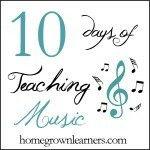 Welcome to Day 2 of The 10 Days of Teaching Music! Today I want to give you a very simple way to help your children listen to great music. Do you know what SQUILT means? Simply put SQUILT is Super Quiet UnInterrupted Listening Time. First, choose a short piece of music. I like to choose pieces that don't have any words and are generally interesting and exciting to children (think Flight of the Bumblebee, In The Hall of the Mountain King, or The Carnival of the Animals!). There is a wonderful list (with links for listening) at Classics for Kids that is a great place to start. If you have a good collection of music you can simply choose your own. Explain to your children that you are going to have SQUILT time. This means they have to be super quiet during the entire piece. Encourage them to listen for instruments, patterns, or form a picture in their mind. Allow your kids to just lay on the floor and relax to listen to the piece. They must be SUPER QUIET! After the piece is over, talk to your children about the music. Help them fill in their SQUILT page. The first few times they will need help; after a few times they will become more independent. The more they listen, the better they will become! For example, here are my children's SQUILT Notebooking Pages as we listened to Offenbach's "Can-Can" (from Orpheus in the Underworld). You can listen to this piece here. My son's sheet (on the left) is very simple. He is a beginning listener. I don't fuss over spelling, grammar, or mechanics. I just praise him for listening! My daughter's sheet (on the right) is a little more advanced. She knows the families of the orchestra and has more musical terminology under her belt. For your littlest ones, two or three minutes of quiet listening is great. For your older children, they can listen to at least five minutes (if not more). We have started keeping a SQUILT notebook, which includes their SQUILT form, and also a composer notebooking sheet for each piece. My friend Jimmie, at The Notebooking Fairy, has a nice composer page for you to use! You can get creative, too. Why not have your children draw while listening? Or, research the piece and write a little about it? The possibilities are limitless! 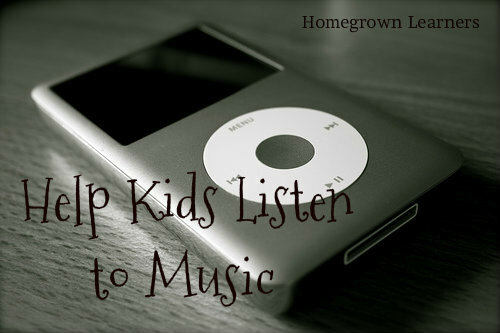 See how simple it can be to listen to music with your children? I hope SQUILT is useful to you! Tomorrow's post will feature a guest post and a great giveaway for your homeschool. If you're interested in exploring history with music you won't want to miss it! Did you get a chance to read the previous 10 Days of Teaching Music Posts?